Flash Vessels are designed and manufactured fully in accordance with PD5500 category 3, inspected during design & manufacture by an independent insurance company and supplied complete with data dossier. 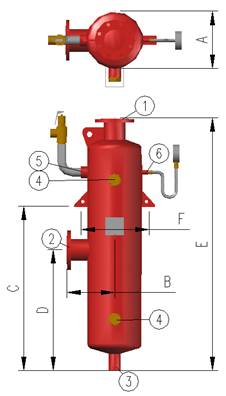 The vessel should be mounted with the flash steam outlet at the top and connected up as indicated on the manufacturers drawing. Each vessel incorporates a 3/8” BSP screwed boss for the pressure gauge. For drainage, it is recommended that float trap is fitted. A safety valve connection is provided on the vessel. However, it should not be assumed that the safety valve will be the same size as the connection. Safety valve sizing and selection should be in accordance with the pressure systems regulations. We offer a variety of sizes ranging from 150 Litres to 450 Litres (other sizes available on request; please contact our sales office for a quotation). Shell material is Mild Steel. Please consult the below table for a full list of dimensions for sizes 150 Litres to 450 Litres. If you require alternative dimensions, please do not hesitate to contact our sales office for advise.